I was so excited to see the interest from our readers in last week's H*O*T Style Quiz and I thought it would be fun to share the results with you! Plus, as promised we drew the name of one of the quiz participants who will get to choose a piece of jewelry that suits her style type. When it comes to your personal style most of you said, 'you had it going on,' with the second most chosen answer being that 'you'd love to add some spice to your style' (Hey, I can help with that!). Not surprisingly most of you strongly agreed that 'clothes make the woman' (obviously, if you took the time to take the style quiz, you think style and fashion are important!). Most of your friends would describe you as 'classic and traditional' with 'edgy and experimental' a close second. If you were to receive a monetary windfall, just about everyone would buy 'classic pieces in the best quality'. This says that quality is still important and we're looking for things that last. Perhaps our addiction to fast fashion is waning? The magazine editorial that would most likely catch your eye would be 'an article on mixing prints' as well 'how to update your workwear.' The strong interest in updating workwear tells me that adding a little spice to your wardrobe feels necessary and is top of mind! As to how you want to be viewed when walking into a party, most of you said 'you want to be the most stylish woman in the room' with 'someone totally in control' coming in a close second. This surprised me a bit. I had assumed Classic would take the top spot but Minimalist edged it out. I had also assumed Feminine and Sporty would be higher on the list. Sporty at 0% takers was really surprising given the popularity of athleisure. I can't believe the number of women running around town in their Lulus! So to summarize, I would say there are 2 extremes at play when it comes to the style of our respondents. At one end of the spectrum are the women who see themselves as stylish and have no fear when it comes to fashion. They want to stand out by dressing Fashion Forward or Bohemian. The other side of the coin is women who see themselves as Minimalist or Classic, who want to be a bit safe and comfortable and might be looking to add some spice to their style. I'll shout it out again, I'm here for you! Check out my services to do just that here. The definitions for each one of the style types are below. The charming illustrations are by H*O*T collaborating artist Pauline de Roissy de Sales. Remember, you can still take the style quiz here to find out your style type and get a quick tip tailor-made for your type. The winner of our style type drawing is (drum roll!) Wes! She won a piece of jewelry specially selected for her style type. Minimalist -- The 90s was your decade. Simple lines, minimal patterns, and subdued color have always been your favorite way to dress. You never want your clothes to overpower or outshine YOU. One piece of jewelry is totally enough. Classic -- You love a good blazer, a collared shirt, and tailored pants. Your favorite accessories start with the letter P--pumps, pearls, and pinstripes. You always gravitate to shades of navy, beige and gray. Your signet ring is your fave accessory. 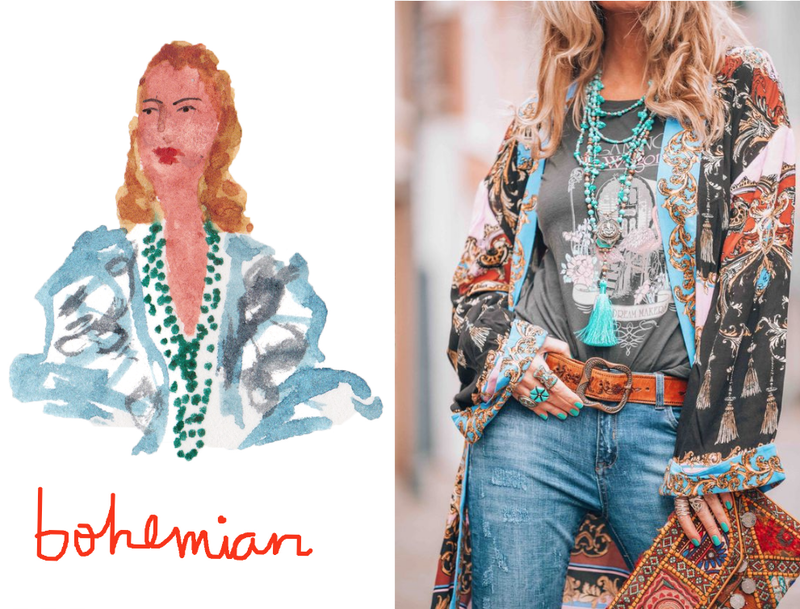 Bohemian -- Your mantra? More is more. You love fringe, bright color, and complex prints. If you love caftans, 70s styling and want to dress every day like you're headed to a music festival, you're a boho princess! Fashion Forward -- You pretty much eat and breathe fashion. For as long as you can remember, fashion and style have topped your interest list. Never afraid to rock an of the moment bold look, it actually gives you a high! Feminine -- You're a girlie girl who never met a shade of pink she didn't like. You adore florals, lace and any cut that highlights your feminine side. Full skirts and styles with a defined waist are your go to pieces. Sporty -- The athleisure trend was created with you in mind. If you could, you'd wear yoga pants and sneakers everywhere. Comfort in clothing is what you always aim for. That said, you still want to look groomed and pulled together.